All Mam’s comforting clutter had been hidden away. Even the picture of rabbits in a field was covered by a white cloth. Rabbit Girl is a tale of two lives that meet in a pet shop. It begins back in 1934 Ireland, when five-year old Tony is taken to say goodbye to his dead mother. Too soon, his father has to go to London to find work, leaving Tony with a neighbour, Mrs Mooney, and the bullying of the local rabbit catcher’s sons. A year later, his father returns to collect Tony and take him back to life in a room in a tenement block, and the occasional care of kindly Doris. Eventually, as time goes on, Tony returns to the green of the countryside, but as an evacuee, extra labour for a farmer whose son is away. The hard tale of Tony’s life is balanced and warmed by the character from the present day: Mallie, a lively fifteen year old girl. Although Mallie has problems, being almost a carer for her mother who is a depressed artist, the pages are very much brightened by the jokes, laughter and fun that Mallie shares with her bold best friend Jamila throughout the book: a most wonderfully described relationship. Mallie is desperate for money to buy her mum a birthday present so she takes on a secret part time job in a pet shop, offered to her by Steve, the man behind the counter, who is caretaking the shop while his dad is in a convalescent home. Mallie copes with many trials and tribulations, including fear of her job being discovered, the return of Mr Armstrong the ill-tempered pet-shop owner, as well as her attempts - encouraged by Jamila - to bring employment and happiness into her own mother’s life. Mary Arrigan skilfully weaves chapters from the past among Mallie’s modern life. Gradually we learn about Tony’s friendship with his fellow evacuee Alice during war time among the Lakeland fells. We also discover, as Tony and Alice do, another important character - a woman farmer and artist at Hill Top Farm, Windermere - and about a drawing of rabbits among green grass that brings rage so many years later. I felt the writing style of this book was very nicely judged for the older junior/KS2 or the young teen reader. Although Mary Arrigan tells the story lightly and almost swiftly, her scenes still captures the impact of moments of pain or sadness. I also liked the way she offers a non-simplistic approach to past times, hinting at the true economic necessity behind what now seems like harsh treatment. Bit by bit, the reader, often alongside the memorable Mallie, understands the reasons behind the older characters behaviour and actions and the story circles round in a satisfying way. An enjoyable and thoughtful book. By the way, all this is written in awareness of the particular surname, Dolan, that Mary Arrigan gave to that rabbit catcher and his bullying sons. 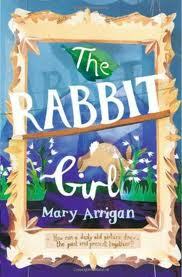 The Rabbit Girl by Mary Arrigan. Published by Frances Lincoln at £6.99.